You might have noticed that I’m trying hard not to have too many fountain pen related blog posts here on Bleistift. One of the reasons why the pencil theme and the name of the blog (the German word for pencil) were chosen was because it feels as if there are orders of magnitude more blogs and resources about fountain pens on the web than there are about the humble pencil. 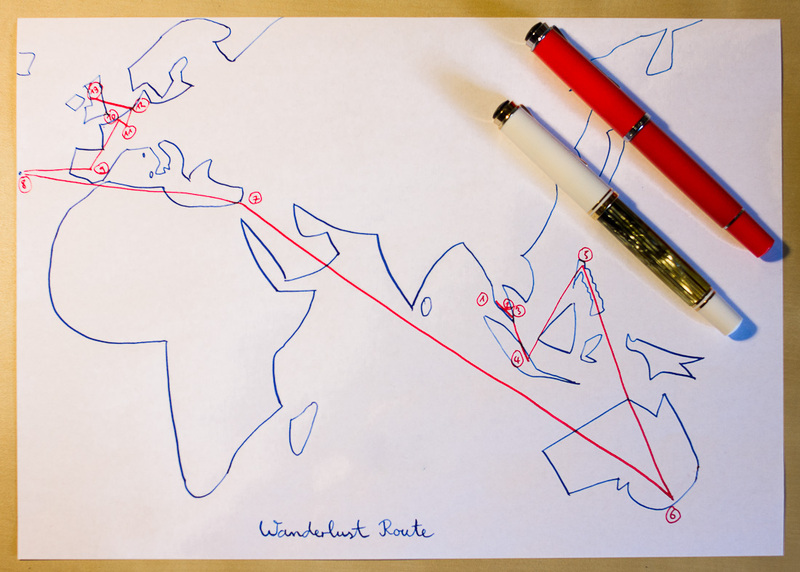 This time, however, I can’t resist focussing on inks and fountain pens …because I have received Pelikan’s Wanderlust ink. For the Wanderlust project an ink bottle1 is travelling around the world I was lucky enough to keep it for a few days while it was on it’s way from from Asia, through Europe, to South America. Before arriving in England it travelled from Malaysia to Singapore toIndonesia to the Philippines to Australia to Israel to the Azores to Spain to Belgium to Luxembourg to the Netherlands. Looking at the twelve letters written by previous participants, I was admiring the different writing styles, as well as the different kinds of paper that were being used. I was surprised to see that many participants share common attributes and could identify with many of them. Other participants were roughly my age and work-wise from many were from a similar background: there were many participants in academia or with an engineering background. Also: half of the participants don’t live in the country they were born in. 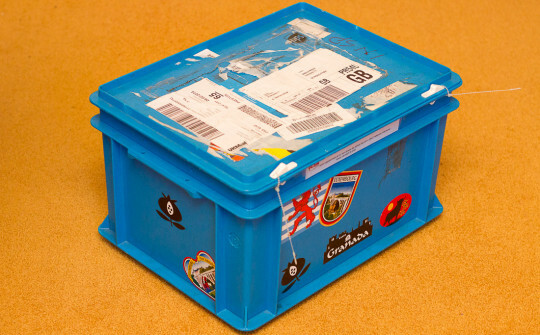 When I first heard about the Wanderlust project I thought the ink in this box would be an ink created especially for this project. 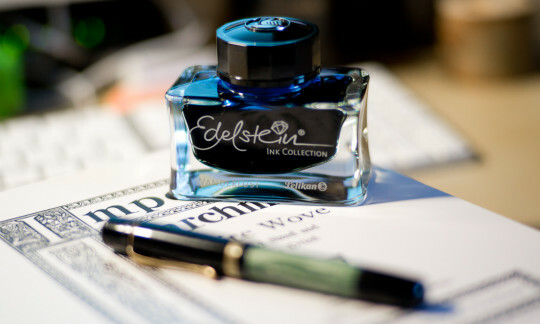 It turned out that the ink in the box was a standard ink from Pelikan’s Edelstein range. 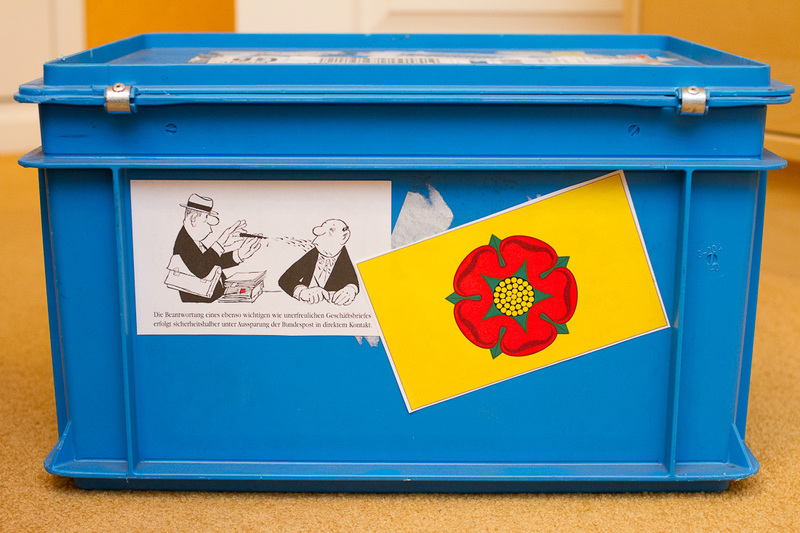 My box did contain their Topaz ink, but earlier participants on my route had a different ink in their box. 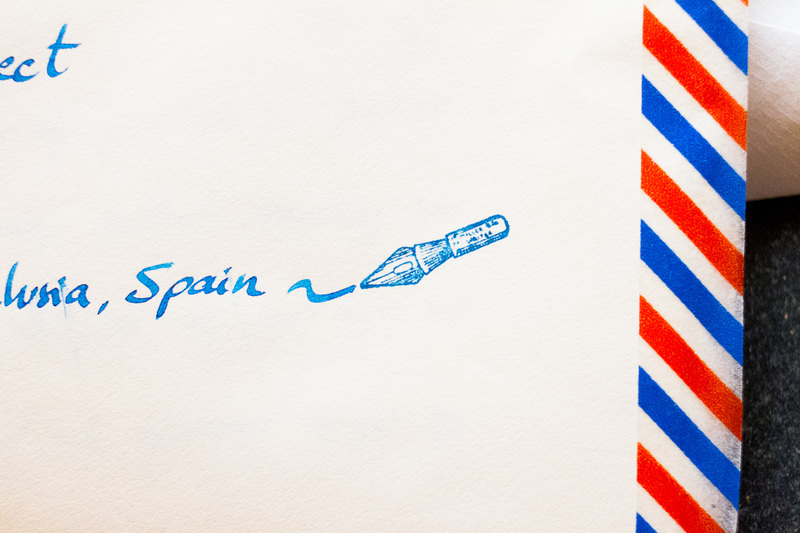 I did plan to use my favourite fountain pen, a white tortoiseshell M4002, but when I read the letters from the previous participants, which included nice postcards from Granada and an olive branch from Israel I thought I should also theme my letter according to my country. I wrote on British paper (Imperial Parchment, White Wove, made in Scotland and recently bought on offer in Tafford Centre’s Pen Shop) and used a Pelikan 100N fountain pen, which as far as I can tell has been produced for the British market in the 1930s or 1940s. It features a G.W. (Günther Wagner, the plant manager who took over Pelikan in the 1870s) stamped nib3. One of the reasons why I love Pelikan fountain pens is their performance. They always start (unlike all my Cross fountain pens), they don’t skip, I never got my hand dirty because of ink in the cap (unlike my Noodlers and TWSBI fountain pens) and even if they even been unused for many months they don’t dry out or have problems starting (unlike my Cross, Noodlers, Hero fountain pens – some of them don’t even survive a few days of non-use without drying out too much to start easily). The only other fountain pen brand I know that performs well in all these areas is Lamy. The only shame is that Pelikan doesn’t make flexible nibs any more4. If you want one you need to get an old and flexible nib or get a nib custom ground one. Pelikan started a nib grinding service recently, but unfortunately they don’t do flex nibs. 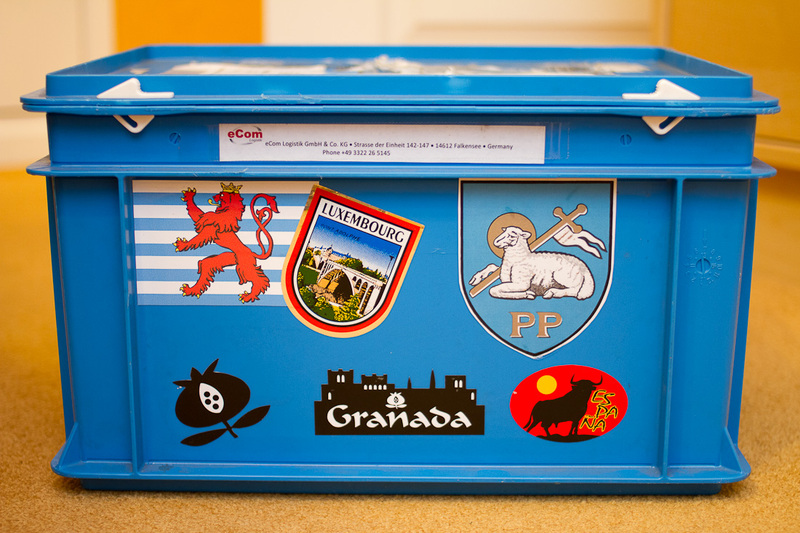 The Wanderlust box will now make its way to South America. I hope the next participants enjoy it as much as I did. What a great project – thank you for showing! Gunther, in case you are interested in a similar experience, Justanotherpen started a similar project ( http://justanotherpen.de/1-jahr-justanotherpen-happy-birthday ). Sean, hehe that’s a fine sounding title. I hope the inhabitants of the countries where the coast lines were particularly poorly drawn forgive me. 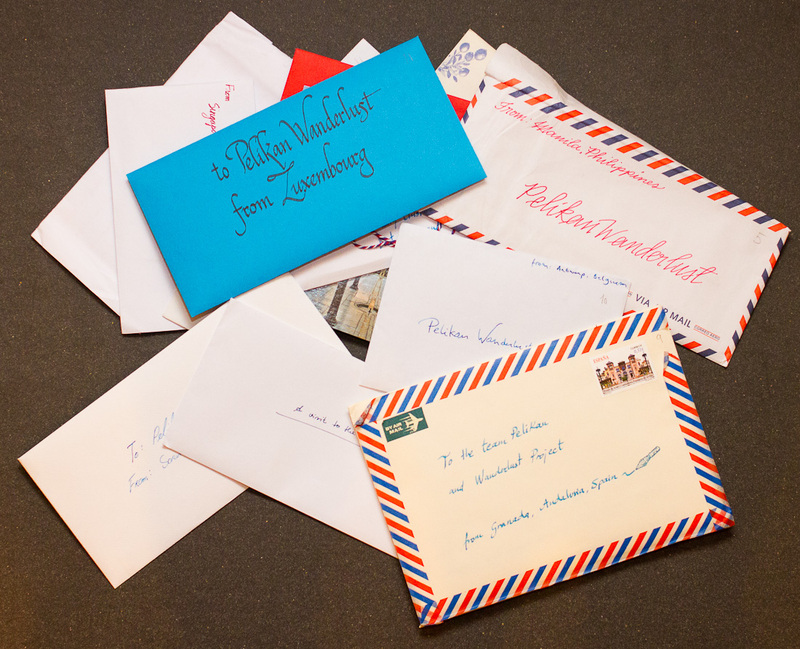 Thanks for sharing this photos (details from my envelope) and your experience…. 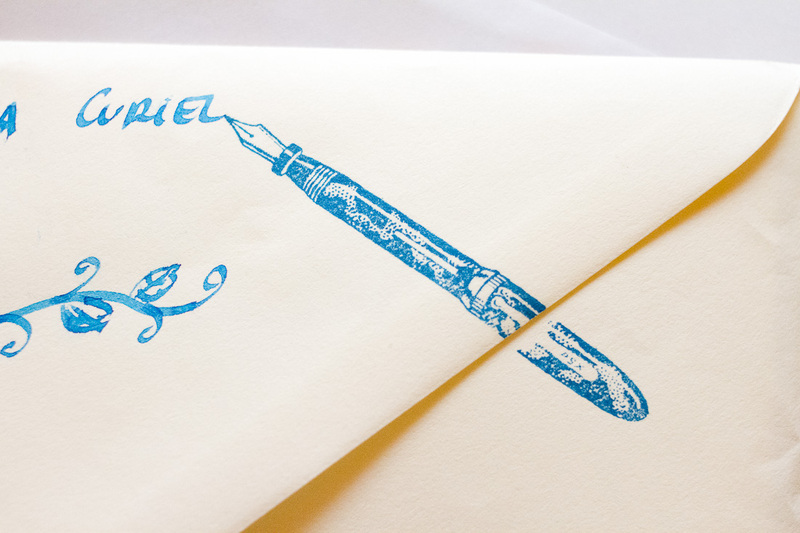 Do you put photos of your letter on Pelikan page on Facebbok? Teresa, thanks for the nice post cards and book marks you put in the box! Your drawings are amazing, how did you get them to fine and precise? Did you use a magnifying glass? I did put some of the photos on Pelikan’s facebook page, but I have still a few unused photos left that I could upload. It must be so exciting to receive the crate! 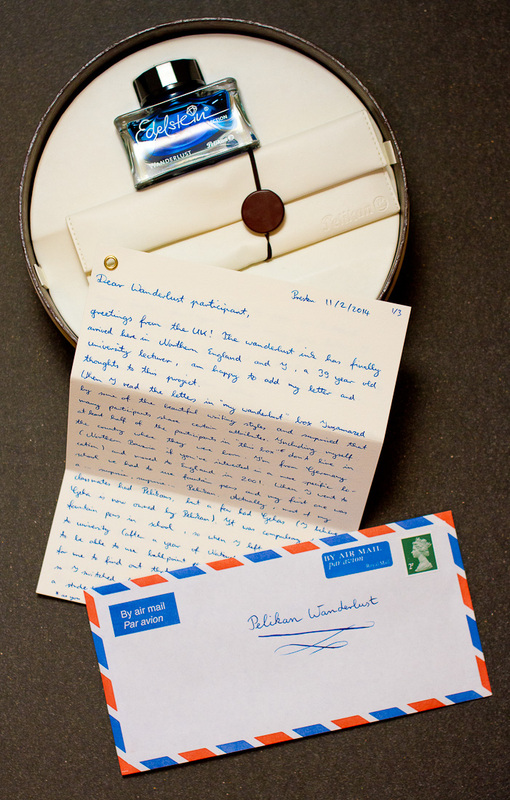 I saw the project on Pelikan’s Facebook page when it first started and thought, oh, that is such a cool idea, must look into it. As you may well guess, time lapsed and I simply forgot about it. The only Pelikan I have is the M205 Duo and I have the BB nib modified to a cursive italic. Though it is only a stainless steel nib, it has such a great feedback and a bit of bounciness to it. Thoroughly impressed as you can tell and hopefully I will be able to get another some day! Stationery Traffic, I only ever handled the M1000 in “The Pen Shop”. It was nice to use. Did you like it because of its size or weight? Shangching, I was very happy when I found out that I was a participant. 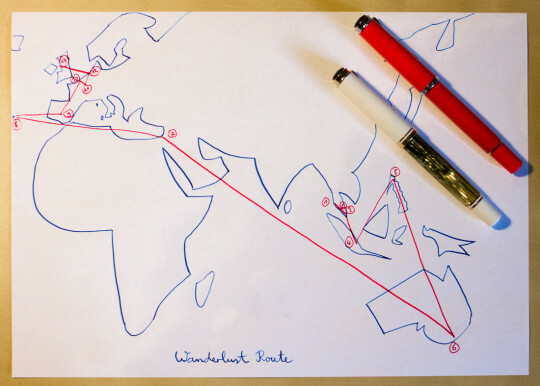 Pelikan did quite a few social network style competitions recently – Wanderlust, their calender 2014, the ink for 2015. I hope they’ll do more like that and hope you get a chance to take part next time. Did you get a nibmeister to modify your nib or did you modify it yourself? I remember your M205 from your blog, but not a nib modification. I hope I’ll come across a nib meister one day. Don’t dare sending a nib to the USA for modification, as I’m worried I’ll have to pay duty on the value of the nib (which was mine in the first place) when it gets shipped back to the UK. I might try one of the UK ones out one day, e.g. http://www.pelikanpens.co.uk/acatalog/Custom_Nib_Grinding.html . Cool, to see that the box didn’t miss my tiny country (Luxembourg) on its way around the world.